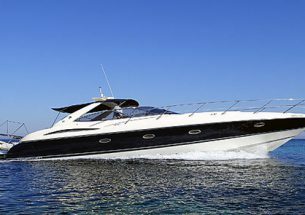 The Sunseeker Predator 60 offers superb handling with composure and minimum fuss, supporting a superbly equipped upper deck and cockpit, which features a large opening hardtop sunroof. 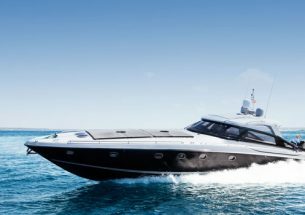 With huge sunbathing pads to the front and rear, she comes equipped with paddle boards, kayak, snorkel gear & noodles for fun, games and exploring those beautiful Ibiza and Formentera coastlines. The extensive cockpit perimeter is lined with comfortable seating and an impressively well specified wet-bar with ice maker, fridge, sink and griddle lies opposite a generous and useful dinette. The white leather circular seated cabin and interior carpeted lounge areas are perfect for socialising. You can plug your own music into the surprisingly chunky 1500W sound system via USB & there’s wifi, retractable sunshades, freshwater shower and bathroom. Perfect for celebrations and popular with celebrities, the Sunseeker Predator boasts a fully fitted kitchen, gorgeous, carpeted interior lounge and handy exterior wet bar. 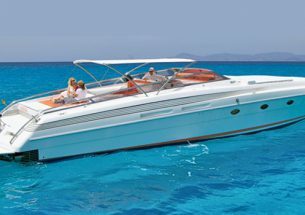 A private charter to Formentera is a must and this is a perfect yacht to enjoy the day in. The price includes skipper, beer, wine, water & soft drinks, mooring in base port, full insurance of the boat and personal accident insurance. 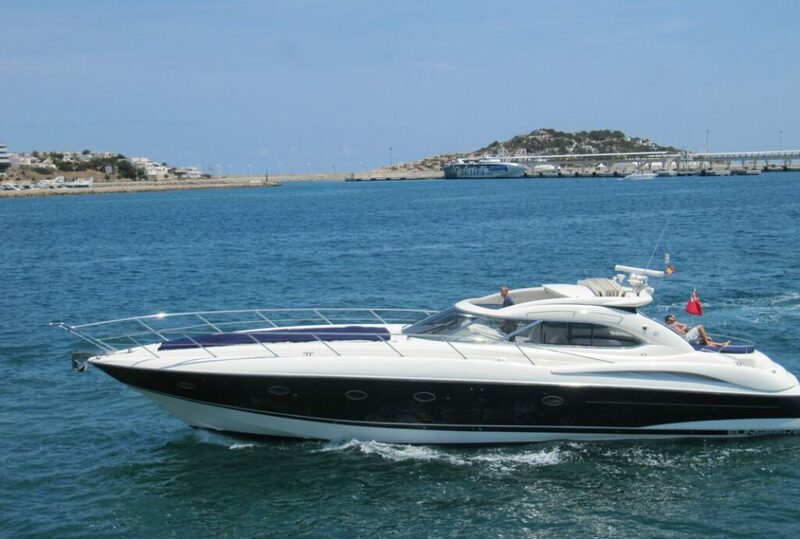 The price does not include extra fuel, mooring out of base port, or taxes (IVA 21%). The rates are not set by Taste Ibiza, are applicable at the time of writing and are subject to change at the discretion of the owner.